But yeah, let’s keep talking about Saudi Arabia and empower Iran. Senior U.S. officials confirmed early Monday that Iran has successfully test-fired multiple nuclear-capable missiles in violation of United Nations restrictions on such activity, drawing a fierce reaction from the Trump administration, which will pressure European leaders this week to take immediate action aimed at countering Iran’s latest military moves. 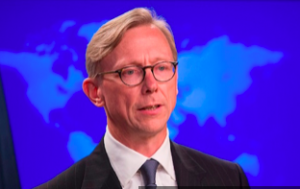 Refuting Iranian claims that its illicit missile tests are defensive in nature, Trump administration Iran envoy Brian Hook vowed tough reprisals for Iran’s most recent missile tests, which are among the most provocative in recent memory. “Iran has launched missiles that are capable of carrying multiple warheads, including a nuclear weapon,” Hook confirmed to the Washington Free Beacon while talking to reporters aboard Secretary of State Mike Pompeo’s airplane en route to Brussels for NATO meetings. The Iranian ballistic missile test comes on the heels of new evidence unearthed by the United States tying Tehran to the proliferation of advanced weaponry and missiles across the Middle East, including in Yemen, where Iranian-backed rebels continue to attack a Saudi coalition seeking to stem the violence.